Each symposium is led by a contemporary artist. This symposium is led by artist Jessica Rohrer. This year’s teacher symposium will include a tour of the current contemporary art exhibitions, a talk by the leading artist, a project, a resource list, adaptable lesson plans, and a review/crit at the end of the day. The symposium will be led this year by artist Jessica Rohrer. Rohrer’s recent work explores the disorienting effect of landscapes drawn from the vantage point of a drone. Using her homes and neighborhoods as source material for her work she focuses on domestic spaces – individual objects, interiors and exterior views of her home or neighborhood. The recent works involve the use of a drone camera that imbues the imagery with socially loaded connotations, as drones’ increasing prominence has led them to be viewed as tools of both aggression and everyday leisure. 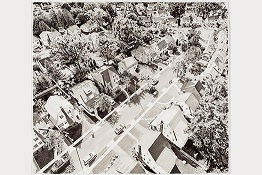 Rohrer uses drones to symbolize our collective declining privacy, as illustrated by the way the images lay bare both the physical and socioeconomic elements of the neighborhood. Conversely, the details in the drawings can also be viewed as being representative and somewhat generic. This neighborhood could be almost anywhere, and as a result, tells little about the families who remain out-of-sight. The exhibition currently on view in the main gallery is called Interior Monologues and focuses on the story our surroundings tell about us so this will be a general theme of the workshop. This group exhibition explores the real, imagined, or implied narratives connected to interior spaces. Several of the artists in Interior Monologues depict real places—some populated by specific characters—while others invent new places based on their own experience or imagination. Many of the works suggest hidden histories or embedded memories and emotions. The interiors devoid of people are like empty stage sets waiting for actors to animate them. Whether public or private, all of these interior settings are activated by the presence (or absence) of humans. This is a multi-media show, incorporating painting, sculpture, drawing, collage, video, and site-specific installation. Participating artists are: Matt Bollinger, Erin Diebboll, Susan Leopold, Dana Levy, Summer McCorkle, Anne Muntges, Casey Ruble, and Paul Wackers. This exhibition highlights Simon Dinnerstein’s monumental three-panel painting, The Fulbright Triptych, begun in 1971 during the artist’s Fulbright fellowship in Germany and completed in Brooklyn in 1974. A complex work, it offers an intimate view inside the artist’s studio and showcases a fascinating array of engraving tools, artistic materials, and personal ephemera. The painting also incorporates portraits of the artist and his family, and a glimpse of the German town seen outside the studio windows. Encompassing an entire wall in the Eisenberg Gallery, the triptych resembles an altarpiece—not devoted to God or saints, but to the secular subjects of art and family. PLEASE NOTE: If your school needs to be invoiced in order to pay for this program, please contact us to register. Call 908-273-9121 ext 213 or at swalko@artcenternj.org, and speak with Sarah Walko.